Write on Africa is a non-profit initiative that aims to create artwork in Africa for inspiration, social change and urban rejuvenation. 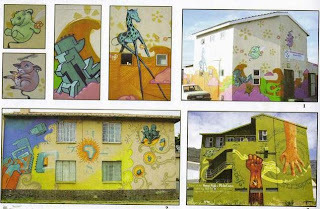 They work with local artists to create beauty on ordinary walls in some of the poorest communities in South Africa. Write on Africa’s immediate aim is to inspire and rejuvenate with color. In the longer term, they hope to share skills with youth in these areas to empower, express and uplift themselves and their communities.